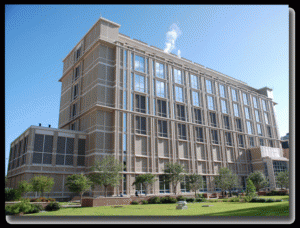 According to its website, the high security national bio-containment lab's mission is to develop "therapies, vaccines, and diagnostic tests for naturally occurring emerging diseases such as SARS, West Nile encephalitis and avian influenza -- as well as for microbes that might be employed by terrorists." The lab's website says "plans are in place to shut down and secure all laboratory operations if a hurricane landfall is predicted near Galveston." It says that "this shut-down and decontamination can be done quickly, with all work in the facility ceasing, the lab locked down, and all infectious agents and biological and chemical material placed into safe and secure storage." A 2008 article in The New York Times about the laboratory said, "Each time a hurricane approaches the island, scientists will have to stop their experiments and exterminate many of the viruses and bacteria they are studying." 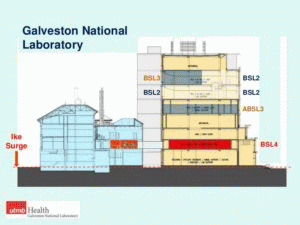 It is not clear how much warning the Galveston lab had. Last Wednesday the National Oceanic and Atmospheric Administration tweeted that "remnants of Trop. Storm Harvey have regenerated into a Tropical Depression." On Thursday NOAA tweeted about "rapidly strengthening ... Tropical Storm #Harvey as it moves toward #Texas." Later on Thursday it upgraded the storm to a hurricane. On Friday it was declared a Category 2 hurricane on the same day it surged to Category 4 and made landfall. The National Weather Service has called this storm "unprecedented" and "beyond anything experienced" before. The storm has so far dropped 48 inches of rain on Houston, a record for a single storm in the continental U.S. About half a million people will need help from the federal government to recover. "State-of-the-art systems built into the design of the GNL help protect workers and prevent any release of infectious agents," the lab says on its website. "Double and triple redundancies in equipment and systems help ensure that if an unexpected failure does occur, a backup is in place to maintain safety."